Cristiano Ronaldo may have found it funny when he received the odd welcome upon arriving for the World Cup, but there is a serious story behind the tradition. Portugal’s football team arrived in Russia on June 9 for the World Cup and received a strange welcome: Gifts of bread and salt. Cristiano Ronaldo found the whole thing pretty amusing as girls in national outfits offered a huge loaf and salt to the players and coaches - which they duly tasted. As odd as it may seem, the gesture is actually an ancient Russian tradition for greeting important guests. Let’s look at what’s behind this ritual. In Russia, guests almost always receive a warm welcome. People in the country go out of their way to make sure visitors have everything, nothing is spared - it’s in their blood. In ancient Russia, bread and salt symbolized prosperity and health, so hosts would put on their best clothes, lay a feast on the table, and offer a loaf or two together with the condiment to their guests. 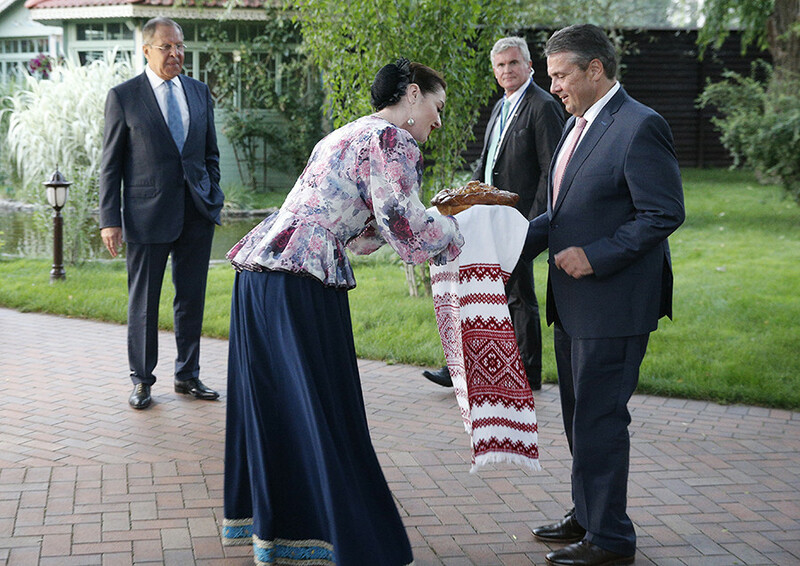 Germany's Minister of Foreign Affairs Sigmar Gabriel and Russia's Minister of Foreign Affairs Sergei Lavrov during a welcome ceremony after a press conference following Russian-German talks. Bread in Slavic culture is considered a sacred thing: No bread at home means there’s nothing to eat - no meal doesn’t include bread. "Bread is the staff of life" is probably the most famous Russian proverb. Today, there is no shortage of salt in the world. But in ancient and Medieval Rus, it was rather expensive and not everyone could afford it. During the mid-17th century the rising price of salt led to riots in Moscow. The salt tax was completely abolished at the end of the 19th century - only afterwards did salt become affordable. That’s why Russians kept it for special occasions, like when they received guests. Scorpions guitarist Rudolf Schenker at the presentation of his book Rock Your Life. It was believed that if someone wanted to offend the host, he just needed to scatter salt on the floor. This gesture expressed contempt. Now salt is not worth so much but scattering it is still used to insult someone - and trust us, it can result in fights. Nevertheless, Russians say the following about true friends: "Together they ate pood of salt," meaning they passed through many difficulties together. According to the tradition, guests are greeted by ladies in national costumes with a large round loaf on a towel with a salt shaker on top. The guest should carefully break off a piece of the bread, dip it in the salt, and eat - this signals that a friendship has been forged between the two parties. An old belief is that if the worst of enemies share bread and salt, they will reconcile. 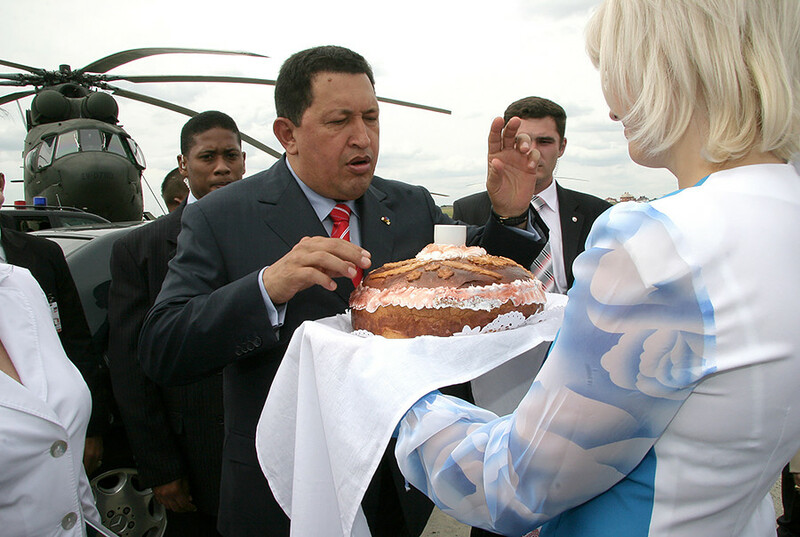 Venezuelan President Hugo Chavez (left) visiting the Rostvertol helicopter plant, 2007. Another version says that salt symbolizes the purity of the soul (it has an unlimited shelf life) and by bringing bread and salt, Russians not only wish wealth to the guests but also drive away everything bad. And also check whether the person is a human, not the evil spirit - naturally. But if the guest did not accept this gift, then he was not allowed into the house to avoid the evil eye and his bad thoughts. Since ancient times, hospitable hosts in Russia are called khlebosolnye(from Russian words khleb - bread - and sol - salt). In today’s Russia, this tradition is still popular: It can be witnessed during official receptions, as well as in restaurants geared up for foreign tourists. 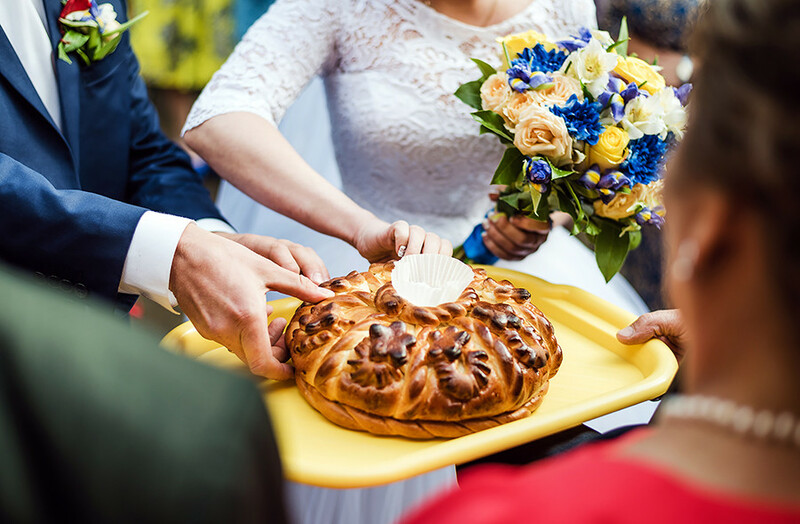 But most often you can see this at traditional Russian weddings, when parents of the newlyweds welcome their children with bread and salt after the ceremony: The husband and wife should break off a piece of bread, dip it in salt, and feed each other. This is a sign that they are ready to share any difficulties in life and promise to always take care of each other.